The vocation to the consecrated life as a religious Brother is a great gift of God! We Brothers are men vowed to the evangelical counsels of poverty, chastity, and obedience in an active-contemplative religious life according to the Rule of Saint Augustine and the Marian total consecration of Saint Louis de Montfort. Ours is a common life of liturgical prayer, mental prayer, study, work, and apostolic action in a masculine atmosphere of joy and sacrifice. Dedicated to the conversion of America to the one, true Church, we are traditionalists, who worship exclusively in the classical Roman Rite of the Church’s sacred liturgy. A young man being admitted to the Novitiate. The Brothers in Saint Joseph Hall at Christmastide. Some of us in Rome, with an Augustinian Friar atop the Church of Saint Augustine. The Brothers on Pilgrimage in Auriesville, New York: The Saint Joseph Brigade. A Brother professing vows in the hands of his superior. We live a “mixed” life of activity and contemplation, at the service of the Queen of Heaven for the glory of the Holy Trinity and the extension of the one, true Church — outside of which no one at all can be saved. Our manifold apostolate, which we call “the Crusade,” includes street evangelism, education, internet radio broadcasting, print and electronic publishing, youth apostolates, and the fostering of a vibrant Catholic community life among the families who worship with us. The Brothers are also responsible for the temporal affairs of our apostolate, which include chopping wood, mowing grass, maintaining our buildings, keeping the books, doing sacristy work, producing print and digital media, and many other things. We do all in a spirit of total consecration to Jesus through Mary for the glory of the Holy and undivided Trinity, and for the salvation of souls. “All whatsoever you do in word or in work, do all in the name of the Lord Jesus Christ, giving thanks to God and the Father by him” (Col. 3:17). Our habit is a modified version of the Augustinian habit, with traditional monastic tunic, belt, and capuche. The modifications are the blazon of our Congregation on the capuche, and the fifteen-decade Dominican Rosary that hangs from the belt. Our habit is worn at the monastery and in public. It is the Brother’s clothing, not a costume. The texts below are taken from the clothing prayers the Brothers recite when dressing. Each garment is first kissed. The Tunic: The full size main garment traditionally worn by monks and friars. The Rosary and Crucifix, with the skull of our father Adam at the bottom. Our daily prayer life consists of Holy Mass in the traditional Roman rite; Laudes, Vespers, and Compline from the traditional Roman office; one hour of mental prayer; 30 minutes of spiritual reading; and the Rosary all in common every day, as well as visits to the Blessed Sacrament. The Sunday horarium is much different, allowing more time for prayer and recreation. Every Sunday we sing Solemn Vespers with Benediction of the Blessed Sacrament. Besides this, men presenting themselves to our Congregation must meet additional criteria. Candidates should be between the ages of 16 and 35 (although in rare cases, this upper age limit may be waived). They must be in good health, docile to authority, and “normal” (i.e., devoid of eccentricities and strange personal habits). While scholarliness is not requisite, they must exhibit a sincere willingness to learn. They must also exhibit the more important desire to grow in virtue, since the religious life is a “state of perfection” in which growth in virtue is a duty. 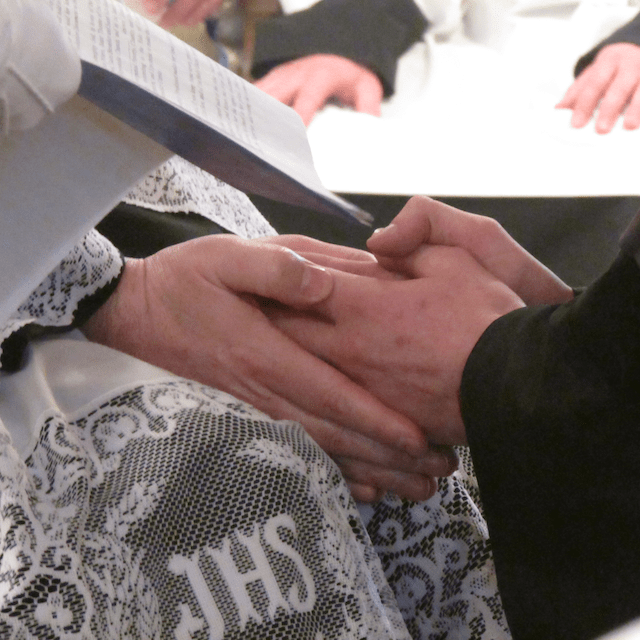 True desire to live in fraternal charity and to observe the holy vows is necessary. Lastly, they must not have any canonical impediment to entrance into the religious life. Some of us pictured with our Sisters. Working with young Explorers in New Jersey. 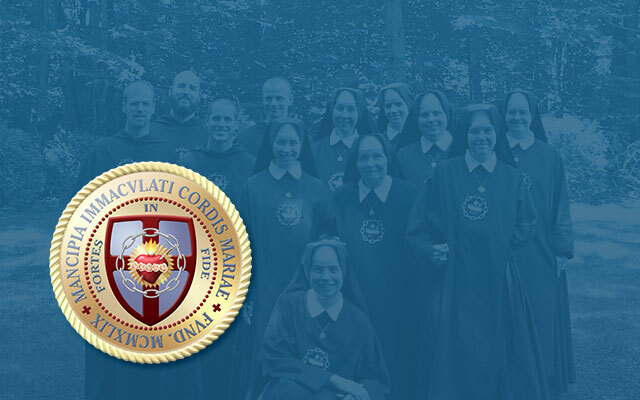 Our formation consists of a six-month postulancy and a two-year novitiate, during which time the Rule, the evangelical counsels, and the spirit of the Congregation are studied. Upon entrance into the postulancy, the Brother is given his religious name and his work habit. The habit of the congregation (described above) is taken when the candidate enters the novitiate, sans Rosary. If the novice is admitted to vows, he first makes his three-year simple profession, receiving his profession Rosary, which he wears in the fashion of a mendicant friar, on his left side, as his “spiritual sword.” After the three years of simple profession, the Brother professes his perpetual vows. He is then a religious for life. Further information on our life, formation, and spirit is available by visits to the monastery. It is only with a candidate’s observing the community (and vice versa) that any serious vocational discernment can begin. To make an appointment to visit, serious candidates are invited to contact us through this website or to call: 603-239-6485 x7.